Cross and inscription "Catholic Church" removed from church facade. The ban on holding summer youth camps for catechism. Meanwhile, the vaccine scandal breaks out, a sign of a lack of moral values in Chinese society. Vaccinating young people in the spirit, helping them discover their faith, would help Chinese society. The considerations of a priest blogger. Beijing (AsiaNews) - The Chinese authorities have been eliminating visible Christian signs, crosses and engravings for several months due to a campaign of "synicization". This adds to the ban on meetings even in summer, with young people under the age of 18, who are also forbidden to attend mass. At the same time, the scandal of ineffective vaccines for newborns has spread throughout the country. This scandal is caused by widespread corruption, by the little control exercised by the authorities; by protectionism for Chinese firms. The priest-blogger Shan Ren Shen Fu ("the hermit priest"), shares his reflection on these events with our readers. In particular, he points out that if more faith and values were spread in Chinese society, there would be less corruption and more effective vaccines. 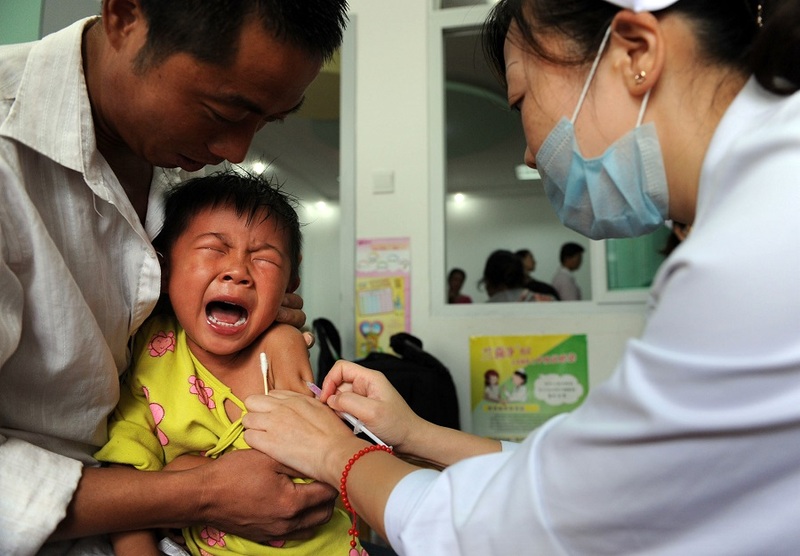 Furthermore, his regret is that in China there is a concern to vaccinate children in the body, but it is forbidden to vaccinate them in the spirit, excluding them from the catechism. In this way the lack of honesty and healthy conscience in society is perpetuated. Yesterday, a brother priest of mine told me on WeChat: "Brother, our bishop called me saying to remove the cross and the inscription 'Catholic Church'." In the last two years this confrere has worked with great difficulty. There was no church in the area, and the diocese bought a two-storey shop and turned it into a place of prayer for the local faithful, since then the priest immediately organized the people to clean up and decorate the place. It was small, the transformation was successful and for Christmas the place wasopened and used.The confrere did his best in every aspect: from designing the altar to buying the benches, he travelled thousands of kilometers to have everything new. As the saying goes: "To do something you have to publicize it!" Just like in business: who can not hang a sign in front of his shop? As a sign, on the roof of the building the priest put the Cross and the inscription "Catholic Church". However, the bishop had just attended the meeting organized by the local government, and the confrere received a phone call that required him to remove the sign that represents the faith. When he contacted me, the sign of faith had already been removed. It had been done by people sent by the bishop or the local government - I did not ask him - but it was obvious that my brother was very sad. I believe he did not blame the bishop for not supporting justice. What saddened him most was why the justice of faith does not find the freedom to coexist in society so difficult. There is a parish priest in the diocese who received an order from the organization: the summer catechetical course must be suspended. The priest complained: my superior is the bishop, and only after receiving the written order from the bishop to suspend the course, can I suspend it. However, in the end, authority is always arbitrary: some parishes do not listen, but the majority are pressured and have stopped holding summer catechetical courses. Then, the Changcheng Biotech vaccine scandal in Changchun exploded. As early as two years ago, with regard to the case of Shandong's "ineffective vaccine," I wrote at the end of an article: "In the great debate about 'ineffective vaccines', the most urgent thing to think about is whether this country has lost the truth, and what is the truth that lives in people's hearts? We should find it and retrieve it ... Unfortunately, He (God) has not been found, nor followed, indeed it was decided we can do without Him and exclude Him". The freedom of [professing] religious faith is a right that the Constitution gives to every person. When a child has no authority for autonomous choice, his natural parents or legal guardians have the right to let their children receive the religion of their ancestors. If this reality does not exist, the law of the state is clearly violated. Therefore no organization has any power to prevent or limit the free search and choice of a person to pursue a religious faith. In addition, religious faith is the basis for forming people with a righteous conscience. Just as a child is vaccinated to prevent disease, conscience can prevent people from making a mistake in the future. I dare not say that there is no evil among all believers, but we can believe that even a bad believer feels bound in their heart to the law of God. After the Changcheng Changshun vaccine case emerged, how many young parents deplored and complained about finding Changchun Changsheng's name on the list of vaccines for children! For this case of damage to the body and spirit of children, the supervision of the responsible government departments proved to be in vain, creating further problems in the sector. For the child's body there is a problem with vaccines, but for the spirit, the vaccine of faith is rejected. Thus, Chinese children suffer dual damage, which is rare in the world! What family has no children? It's really hard to understand! As long as the authorities can continue to blindly lie, human life will never be safe . After the Changchun vaccine problem, some places have immediately announced that their city has not bought the medicines in recent times to reassure the public. However, some residents immediatley posted photos online of the Changchun vaccine that was on the site of epidemic prevention: it is really a direct slap in the face, because the hospital that used the vaccine is in this city. A vaccine is dangerous if it does not produce any effect. What can be said about the danger of faith? If Chinese children are 'castrated' from an early age and prevented from receiving faith in God that naturally exists in the human spirit, then in a world without God, generation after generation, the tragedies that violate the depths of human consciousness will inevitably continue.